Shoreline monitoring is often a desired or required goal of volunteer groups and local entities, but protocols and guidelines can be hard to find and misleading if not used appropriately. To overcome these obstacles, the shoreline research and management community needs standardized approaches for monitoring, and a “toolbox” of protocols and information. The toolbox emphasizes methods that are simple and affordable, and that can be used for monitoring restoration sites and evaluating status and trends. 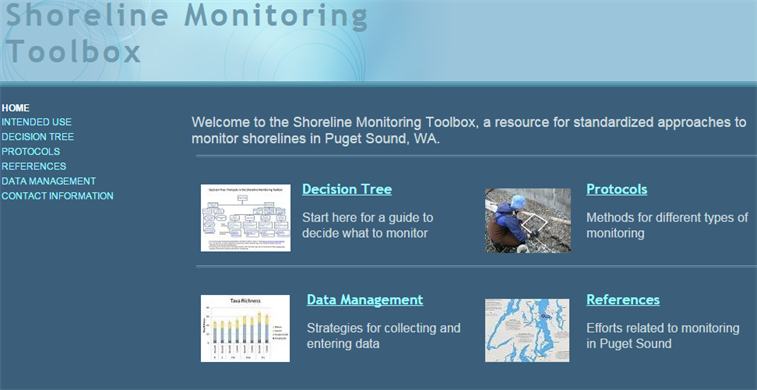 The toolbox is coordinated with the Puget Sound Ecosystem Monitoring Program’s (PSEMP) Nearshore Work Group in order to provide resources for technical expertise. Primary components of the toolbox include (1) a decision tree that will help guide monitoring choices, and (2) organization and documentation of protocols that are not well known or are not in digital form. The goal is to have the toolbox be a platform that will build upon other resources to fulfill monitoring needs. The toolbox can help inform decisions to catalyze action by (1) providing effective guidance for how to monitor, (2) helping environmental entities and organizations access the resources they need in order to move forward in their goals, and (3) providing a feedback loop of completed projects that can inform future projects. Jason Toft is a research ecologist with the Wetland Ecosystem Team in the School of Aquatic and Fishery Sciences at the University of Washington. Development of the toolbox was coordinated with Kate Litle and Jeff Adams at Washington Sea Grant and participants in the Puget Sound Ecosystem Monitoring Program’s (PSEMP) Nearshore Work Group.